Bird Island is perhaps the most breathtaking view in Saipan. A short walk down stairs from the road will take you to the high cliff overlooking Bird Island. The little island is home to thousands of birds, hence the name. You can still see holes in the soft cliffs of Bird Island from the mortar shells of World War II. We occasionally see sea turtles from this overlook. Before you arrive at the overlook there is a dirt road heading to the left. You can walk down that road and follow the trail down the steep hill to a beach which is protected by the reef around Bird Island. If the tide is right it is possible to wade across to the island itself, but dangerous if the tide comes in. Walking around the island you can see deep pools in the rocks which is home to hundreds of large colorful ocean fish. 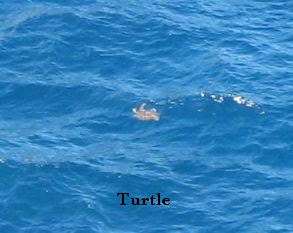 I took this turtle picture from the Brird Island overlook. Overlooking the Bird Island Overlook. That dirt patch in the lower center of the below picture is the Bird Island overlook parking lot. This picture shows the dense Marpi Jungle just inland from Bird Island. That is Bird Island on the lower right of the below picture. This picture was taken while holding on to the side of a very tall and very steep chimney mountain that you can see while driving the road to Bird Island. The trail to the Bird Island Beach is steep and usually slippery. The below pictures were taken from the Bird Island Beach. Front and back of a marble marker found in the jungle. 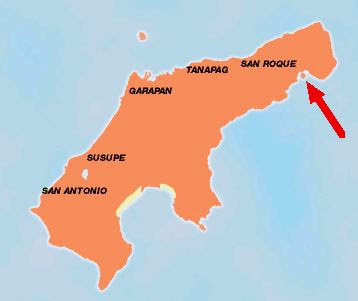 The ocean around Bird Island and the surrounding jungle is a protected wildlife preserve. No hunting or fishing is allowed which makes for good natural wildlife viewing. The below two pictures were taken from the opposite side of the Bird Island bay while walking through the jungle from the Grotto. The below picture was taken from the road to Kalabera Cave. While in a controlled slide half way down a very steep hill in the jungle near the Bird Island Beach, I managed to come to a stop at a dead tree. This coconut crab was also holding on tight to this dead tree. He was sure surprised to see what dropped out of, what would seem to be, the sky and landed next to him. Beautiful! Hope it doesn't get ruined by those swimming to it. Thank you!! We are going tomorrow!! I love this. Bird island or Islan Paluma. So beautiful place !!! Thank you for sharing these pics ! Greetings from Spain. Un saludo desde España !